Now you can enjoy free economy class airfare on new bookings made by April 30, 2019! Receive Free Economy Class Roundtrip Airfare! 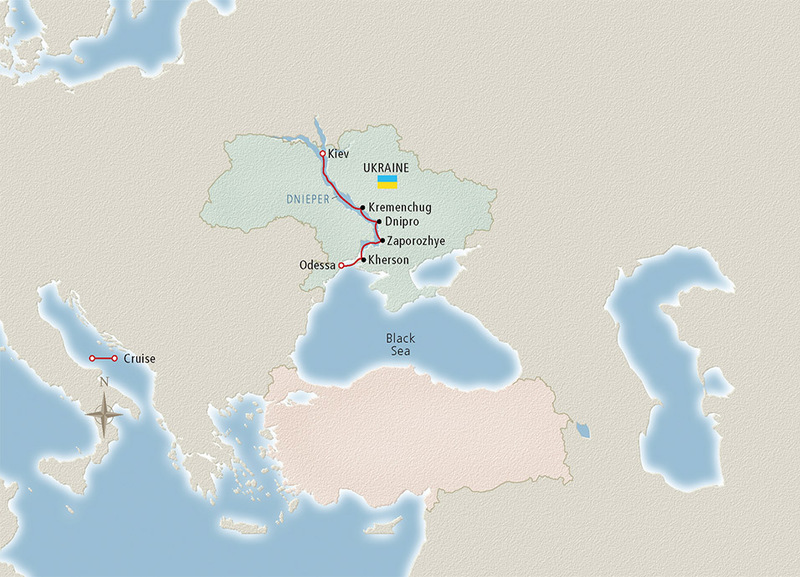 Arrive in Kiev, capital of Ukraine, and transfer to your ship. * After boarding, take free time to relax before dinner, or join our “welcome walk” to stretch your legs and start getting oriented. Spend the next few days exploring Kiev, capital of Ukraine and one of Europe’s oldest cities, with a heritage of Viking, Cossack and Ukrainian peoples. See its historic buildings and monuments, and take a guided tour of the lovely St. Sophia Cathedral, a UNESCO World Heritage Site crowned with 13 glimmering domes. On Day 4, enjoy a city tour of Kremenchug. With its riverside location along the trade route between the 16th-century duchy of Muscovy (today’s Moscow) and the Black Sea, this town has grown into a wealthy Cossack center. Undulating hills, vast open landscapes and a bend in the rambling river lead to Dnipro on Day 5, a former fortress settlement. Day 6 – After breakfast, tour Zaporozhye, ancestral home of the Cossacks. Drive along the 6-mile Cathedral Prospect; see the dam and the city’s massive hydroelectric plant, including its massive turbines that are visible through the windows. On Day 7, enjoy a morning of scenic cruising down the Dnieper River through a rich, fertile landscape of corn and watermelon fields before arriving in Kherson this afternoon. Spend the next few days exploring Odessa. Enjoy a half-day city tour of Odessa, an elegant city of terraced hills and landscaped parks.tour of Akkerman Fortress in Bilgorod-Dnistrovski, a mighty and imposing citadel dramatically overlooking the Black Sea. It is the largest and best preserved fortress in Ukraine. Later, spend more time exploring Odessa’s stately 19th-century architecture, a blend of its Russian heritage and Mediterranean sensibilities, or stroll along its miles of sandy beaches.Visit the Odessa Art Museum in Potocki Palace, a treasure of 19th-century architecture and colorful, eclectic interiors.